This chapter examines the maturation of homo economicus as portrayed in Don DeLillo’s Cosmopolis (2003). Situating the novel within the digital information age inspired by the neoliberal capitalist system, Comyn argues that Cosmopolis both explores the discourse of projection and futures that define the virtual market, and also highlights the romantic vision that accompanied the boom of the Roaring Nineties. This chapter demonstrates how the characters Eric Packer and his assassin (Benno Levin) are representative of homo economicus on either side of the divide created by the virtual capital that saw its ultimate ascendancy through the Information Revolution. 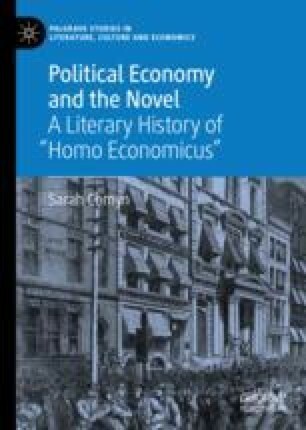 Comyn’s analysis shows that the rise of the virtual market reinstalled the mythological aspects that accompanied the birth of the modern market and its promise of lucre, as well as the figure who was tasked with mining its depths: homo economicus.